British Triathlon arranged a very special weekend camp for the junior girls, the luckily few were Sian Rainsley, Leah Peploe, Fifon Harrett and myself were going to spend time with Helen and Marc Jenkins. Helen is a 2 x world triathlon champion and came 5th at the London Olympics so I was very excited to train with her and get as much advice as possible. We travelled Friday night to Wales and first stop was the Guest House and then we were off to Helen and mark's house, just a bit excited and nervous all rolled into one. Helen and Mark were kindly cooking us our evening meal which was also going to give us time for lots of questions. Helen chatted to us about her injuries as she has had around 3 years out due to different injuries and the reasons why she never gave up. There was always a goal to keep her motivated but her advice to us was never rush the injury and understand your body whether it is in pain from injury or in pain due to tiredness. The better you know your body and discuss problems with the coaches about the pain the quicker you can find the problem and make it better. Helen kindly shared her story about the build up and racing at the 2012 Olympics at London, very interesting. Saturday was our first training session which was and easy 3h ride. Normally a 3h ride where I live isn't too difficult but this area in Wales where we were was a little bit hillier but this made for a good training session. We added in to the ride 2x10min efforts tempo pace, this was a great extra as I could put my legs through race pace and a valuable addition to the session. I found this very interesting as this is something that has never been suggested to me before on a steady ride, I will use this session again on my own rides. Our second session on the Saturday was a 20m run to the pool then a 90 minute swim set. I found the pool session hard as I work at a different intensities and longer reps with shorter rest. My view on the purpose of the session was to work our front end speed for the start of a triathlon to make sure you are in the front pack for the swim and reach the first boey in clear water. I found that this was a hard session as it was at high intensity for long period of time something I don't really do at my club. At the end of the session we used a stack which is a type of a weight machine that you use in the pool this makes a resistance on you and makes it hard to swim. It was a very good exercise and made me realised that I need to work on my strength in the pool, I will suggest using this to my swimming coach. After a hard day of training we went back to Helens and Marc's for dinner. That evening’s conversation was about Helens forthcoming season. We also talked about her training and results as a junior athlete; it was useful to make our own comparison. She started triathlon at the age of 15, quite a bit later than all of the girls on the camp but as Helen came from a swimming back ground the most technique discipline she was already sufficient. We also asked if should could go back and change something what she would change and she would have worked harder on strength and conditioning and possible the results would have been less injuries. It made me realised the little things can be more important then the big sessions for example foam rollering, stretching, core this all helps you stay fit. I went back to the Guest House for bed with my brain full of information, ideas and more questions for the last day. Sunday our first training session was a steady run for 50 minutes. This was great as we could see the type of surroundings Helen trains in and she also explained the type of runs sessions she does and why she likes to run on different terrain to make it more interesting. The next session was in the gym, Helen felt this was a important part of development. It was our turn to show Helen part of our training with our strength and conditions exercises, all of us agreeing on the importance of them, Helen added that she also does them in front of the TV which is one of the habits I have. At lunch we talked about university life as all of us girls are at the stage of our education were we may need to think about it as an option for our future. Helen and marc both didn’t go to university and they talked about why and told us about other ways to train and compete in our sport at elite level. I have not got a set goal at the moment so this advice was very helpful and something I was keen to share with my parents. 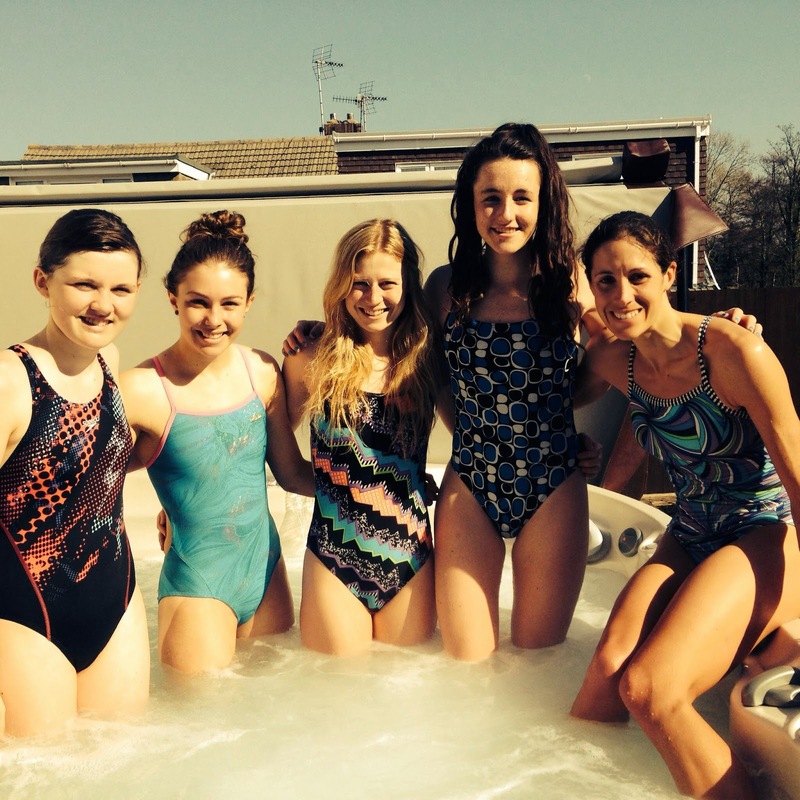 After a hard weekend of training we finished the weekend in Helen and marcs hot tub which was so cool and a great way to finish the camp. I would just like to thank Helen and marc for entertaining us in their home and a brilliant training weekend and sharing their triathlon experiences. I would also like to thank British triathlon for arranging the trip for us.